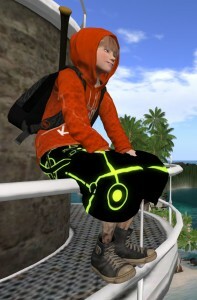 So i looked back at 2013 and made some predictions for whats to come in Second Life. Now I’m going to share what mischief I’m personally planning to get up to in 2014. The risk here is that what ever i say I’m going to do i usually don’t because something else pops up to delay or change it. In the past I’ve promised all sorts of stories and experiences only for them to never manifest, so these will be projects I’m HOPING to do this year. Continue rebuilding & developing Escapades island. If you own a region and are anything like me then you will always be seeing other peoples places and wishing things would look as good as theirs. This year i’m hoping to continue replacing old sculpt builds with Mesh. On the list is still The Goondocks, Castle Ruins, Pirate fort, and Cliffton house. Im also building new areas to explore such as the Vector Realm and the Sky Pirates village. Thanks to the Materials Alpha Masking feature i hope to spend some time creating a whole pack of great trees and vegetation and do some really interesting mesh landscaping. The Bashables is a gaming system on Escapades that allow you to find and bash open objects for prizes all over the island. It’s currently at version 4.0 which introduced a health metre but suffered from a script bug that caused all the Basahbel objects scripts to die. My friend Richardious discovered this and re-wrote the script which i will use in either a 4.5 update or wait for 5.0. In Bashables 5.0 I’m hoping to develop a new part of my gaming toolset ‘score keeping’ which will allow keeping scores, or remember weapons you’ve collected or level up your progress unlocking all sorts of stuff… thats if i can figure it out. It’s something i need to figure out and 2014 is the year i plan to do that. Back to organising role-play events. As for the old Babbage Chronicles Hunts, i plan to re-work them into one big HUD based hunt game so that everyone can play it again and rediscover the secret history of New Babbage. The LEA (The Linden Endowment for the Arts) is one of the best things about Second Life. During 2013 The Goonies Group ended up at several LEA builds and were always mesmerised by the messages learnt or visual styles. It was around the 2nd anniversary of the death of my best friend that i started to consider a story i wanted to tell using what i’ve learnt in Second Life. I originally thought about creating the experience on Escapades but then started to consider applying to LEA. Well things got busy and i forgot about it until just before christmas when someone from LEA contacted me about possibly doing something in january as someone pull out. There simply wasn’t enough time for me to create anything so i had to decline but it did make me rethink about my idea. I will at some point in 2014 apply for an LEA grant this year. Even before i had finished the Behemoth at SL10B i had already decided what i’m going to do this year. Wether there will be a community centred event as in the past, who knows. All i will say is this year will be a blast from the past. I would like to do more tutorials to help my friends with their Meshing about, Bringing them up to speed on materials. I might have to do what LL do and have user group meetings for Escapades. We already have Town meetings but they are not fixed weekly things, maybe this should be a weekly thing. Goony adventures were once a month but suddenly stopped when i became to busy. The adventures are very important as people learn a lot about how to use Second Life while making friends and experiencing new places. I will try and organise other Goony members to take over when I’m stuck in content creation hell. This is just a few of the stuff I’m looking to do this year in SL. Things like the Oculus, leap motion, the mythical Experience Permissions system or something else LL has kept secret might cause all my plans to be pushed around or even out into 2015, you never know with this platform.